Coconuts come from the coconut palm tree, and even though the word "nut" is found in its name, it technically isn't one. The coconut is actually a fibrous one-seeded drupe, which is a category of fruit. While some could argue that nuts are also one-seeded fruits and that therefore coconuts are also nuts, they lack any other botanical characteristics of nuts. The way a fruit, like a coconut, is formed, is very different from the way a nut is formed. Both have seeds, which are edible, but the way they are constructed is different. The endocarp - the hard woody portion that contains the seed. In this way, a coconut more closely resembles a peach than it does a nut. What you see when you purchase a coconut is actually the endocarp, or the covering over the seed. When a coconut is left on the tree rather than harvested, the outer green husk eventually turns brown, and the coconut falls from the tree. There it matures and over time a green shoot will appear through the shell and husk. The new plant feeds off of the water and coconut meat inside, until roots also push through and a new palm tree is born. The roots attach themselves to the soil below, where all of the additional nutrients it needs can be found. A nut is technically also a fruit, but a very different kind than the coconut is. While the coconut has three layers around the seed, a nut only has one. At maturity, the outer wall of the nut becomes hard and stony, protecting the seed inside. True nuts do not open on their own when they reach maturity. The list of true nuts, versus other seeds that are sometimes called nuts, is relatively short. Hazelnuts, pecans, chestnuts and walnuts are the only true nuts that are normally eaten. 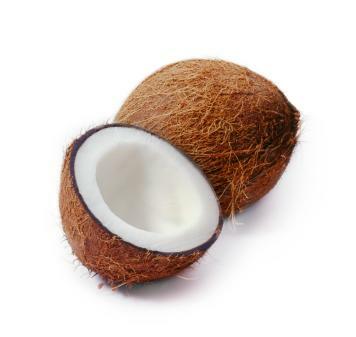 All other foods sold and eaten as nuts, are closer in makeup to the coconut, which helps lend to some of the confusion. The coconut classification debate is one that many people like to argue over. When looked at botanically, however, it is clear that a coconut is a fruit and not a nut. However you want to consider it yourself, it is still just as delicious.